Last week I wrote of how the Apostle Paul addresses most of his pastoral advice letters to the “saint” of the first churches. The Greek word means “holy ones.” We tend to imagine crazy hard-to-believe stories of paragons of spiritual perfection, yet the term actually designates those who walk and live in the Way of Jesus, seeking to be holy as God is holy: living into and from their faith it the world. This week I interviewed a saint who lives among us in the East Bay: Noel Moritz. She is passionate about helping those without…homes, shelter, food, stability and security. It’s a vocation that comes from her faith that Jesus is coming into the world, that the advent of Christ is in the future – and also every day. I’m touched, moved and challenged by her courageous and contagious discipleship and service. She has worked for 15+ years with a great local interfaith homeless network named “April Showers” [Check them out online HERE.] When I hear her talk about her work with folks, helping them to get showers, food, talking with the forgotten, noticing the overlooked, sitting with the neglected…I find her saint or “holy” example pulls me towards action, generosity and solidarity. 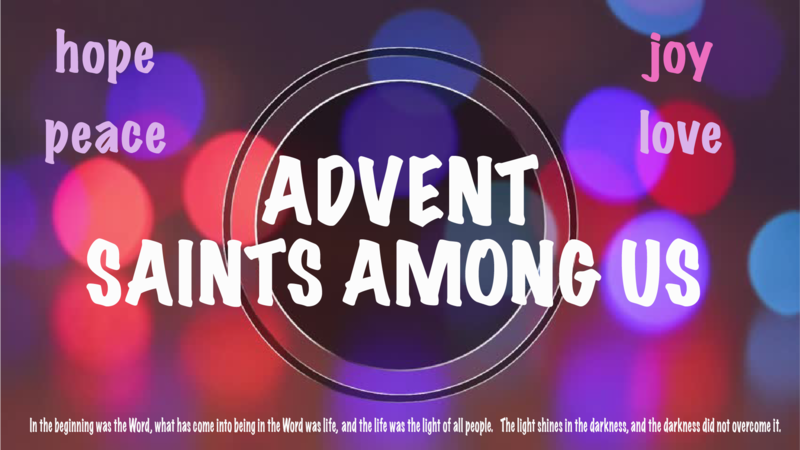 In this Advent season, how are you living for Jesus, actively anticipating his return, preparing his way, building the beloved reign of God in our word through your words, silence, actions, rest, relationships and in your becoming? Who are the saints among us who push and pull you, by their example, towards more holy living?